May is often a traveling month for many local anglers. After surviving yet another long winter, nothing feels better than soaking in some vitamin D, walking barefoot on a beach, ditching your iPhone and losing the whole concept of time. It’s a beautiful thing, especially if you have a fly rod in your hand. The tarpon migration is in full swing down in the Florida Keys, rooster fish are surfing the breakers along Baja, and bonefish are tailing the flats in the Bahamas. These saltwater pursuits are damn fun and are highly recommended. But what if you can’t afford thousands of dollars for a weeklong stay in some exotic destination? Let’s just say that a few thousand bucks is a lot of freaking money for this single parent living in the Roaring Fork Valley on a fly fisher’s budget. As much as I’d love to be in the salt right now, I simply can’t afford it. My time will come again soon enough, but it won’t be this year. It’s the so-called “mud season” right now, and to be honest, the trout fishing is only fair at best. The Crystal, Colorado and Roaring Fork rivers are the color of chocolate milk. The Fryingpan is clear and can fish OK, but it is between hatches, on the back end of the midges and BWOs and prior to the caddis and PMDs of June. Plus, there’s no shortage of spawning rainbows up and down the river that I really don’t need to pester. Thankfully, May yields the best bass and bluegill fishing of the entire year. 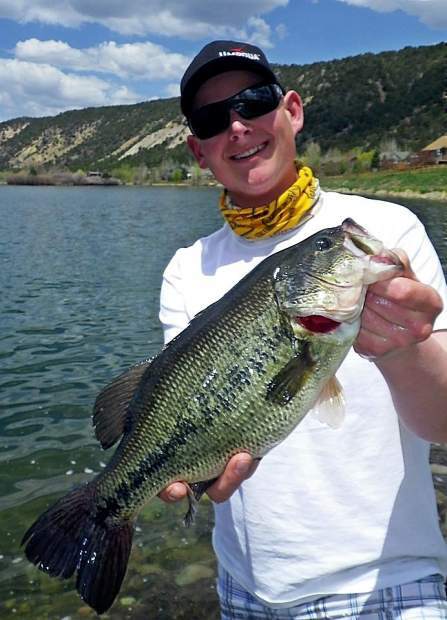 Western Colorado is not known for its warm-water fishing, and that’s OK with me. There are handfuls of wonderful lakes, ponds, reservoirs and ditches teeming with largemouth and smallmouth bass, bluegill, sunfish, carp and catfish. To me, a bass and bluegill fisherman from Michigan and Colorado’s Front Range, these waters are kept and held more secret than big, high-country cutthroat locations. I’ve done my homework researching books, talking to Parks and Wildlife officers, spending hours on Google Earth, and putting time in behind the wheel and hours on the water, all in efforts to find a secret stash of fish. Sometimes it can be a bust, and sometimes you hit the jackpot. Such was the case this past week for me and a group of fishing buddies. We traveled north and west, hitting up several such places. Some of the waters were seemingly devoid of fish; others were brimming with fish. We caught several quality bass in the 2- to 3-pound range, bluegill that were bigger than our hands and carp as big as small dogs. None of these fish is big enough to garner much attention from most, but when you do your homework and have secret stashes of fish, the rewards are always greater to me. Go explore! “On the Fly” is provided weekly by the staff at Taylor Creek Fly Shop in Basalt.